Never in the history of Las Vegas has there been such a complete destination. 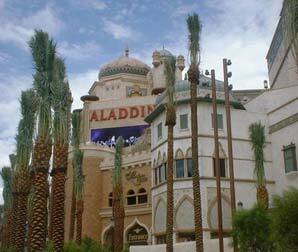 Never before has there been a place better designed to fulfill your desires and capture your imagination - The Aladdin featuring the city's largest collection shops, restaurants,sights and entertainment, plus an exotic environment specifically designed to meet your needs. It's everything you could ever wish for. Standard - 1 King or 2 Double Beds.